Eleven-year-old Callie Fleming is a passionate animal lover! She’s been waiting all year to enter photos in the I Love Nature Photo Contest. Her dad, who is the coolest dad in the world, is an award winning photographer and Marine Corps Reserves Sergeant. She is leaning on his help to win. But when her father is untimely deployed overseas and becomes strangely silent to her emails, she finds her whole world crashing down on her. Can she muster up the courage to step out on a journey that whisks her away from all the things she loves? Join Callie on a journey of hope, trust and the power of prayer! 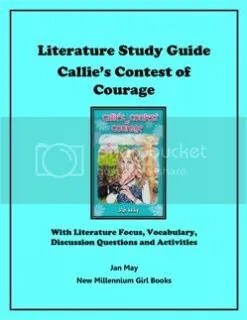 Visit the New Millenneium Girls website to find out how to purchase your own copy of Callie’s Contest of Courage for $7.95 plus shipping and handling. exercises and language arts and fun activities. Perfect for Book Clubs or individual studies. You can purchase it soon for $8.95 or it’s free for a limited time when you sign up for the newsletter at the New Millennium Girls website. I had the chance to review Jan May’s other girl focused book, Isabel’s Secret, two years ago so when Jan contacted me about reading and reviewing Callie’s Contest of Courage I knew I had to accept. Jan writes the New Millennium Girls series for girls of the ages 8 to 12 years old but if your older daughter is looking for an easy, inspiring read then she’d probably enjoy it too – I know I did but I won’t disclose my age in this review! She desires to have books for girls who love God and want to honor Him, so her books are big on faith – if you want a book that a non-Christian could read this isn’t your book and I love that about this, I think there may be even more faith in Callie’s book than there was in Isabel’s, there simply aren’t enough Biblical girl books for girls to enjoy. Since Callie’s dad is in the service I thought maybe we’d be dealing with the harsh reality of war and death, thankfully that wasn’t tackled in this book, but faith was – everyone had faith that Callie’s dad would come back to them. I don’t want to give too many spoilers so I won’t divulge too much here, but this book was a great read and even had a little bit of suspense but not so much that my very sensitive 10 year old would be scared. I was also give the 74 page literature guide to go along with Callie’s Contest of Courage – normally I feel that I just want my children to enjoy reading and so adding in more school takes away from that, however, this literature guide makes things fun and not so school-like. Each chapter in the book is also in the study guide with literature focus questions, discussion questions and an activity (this could be writing out and memorizing a Bible verse, mapping and more). To save on ink I’d suggest only printing what you need and either discuss all the questions including the literature focus ones out loud or on a separate sheet of paper. There isn’t an answer key but the book is an easy read so moms and dads could easily read it to make sure they can discuss and check their child’s work. This is a great tie-in and will make the lessons in the book come a bit more alive and understandable for children instead of just reading the book and forgetting it. Jan also has something for boys, Spies of the Revolutionary War writing and lapbook study – although I’d think girls might be interested to especially if they are currently studying this time period or maybe know of a great grandparent who served. The New Millennium Girls website is chock-full of extras such as other writing curricula for all ages, a homeschool resource page with links to writing contests, free writing prompts and more, so check that out and it’s free. Also be sure to visit the bookstore where you can purchase books and curricula easily and check out Jan blog’s where she writes more on writing, homeschooling and Jesus. This giveaway is open to anyone in the continental U.S. who is 18 years old and over! All entries will be verified! The contest will end on 10/6/14. Click on the link below, it might work better if you right click and open in a new tab so you can come back to my blog to comment. 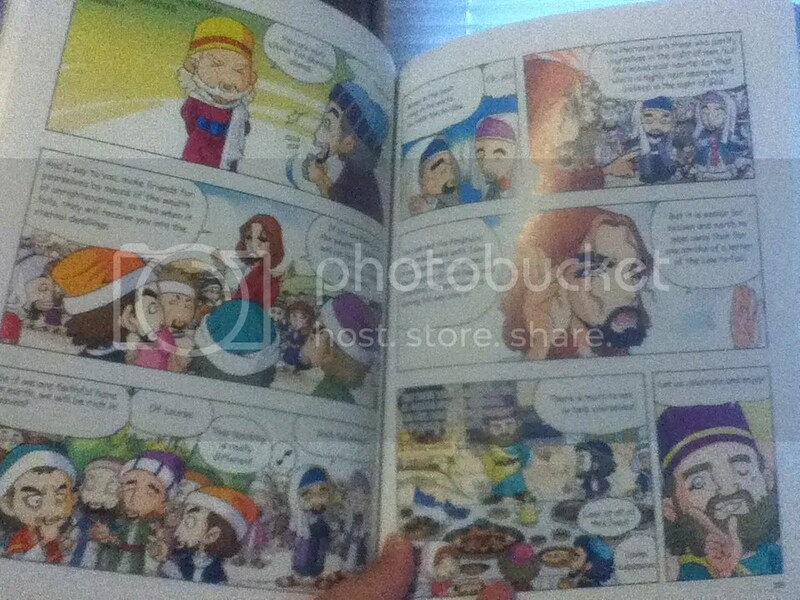 The Power Bible is a ten volume series that presents the Bible in a comic book format which appeals to all ages. From Genesis to Revelation, the Power Bible tells the truths of God’s Word in a fact-checked, fun-to-read format that kids will want to pick up again and again! – Out of the darkness, God creates the heavens and the earth. – He creates all living creatures, and creates man in His own image. – Adam and Eve disobey God’s one rule to them and are driven out of the Garden of Eden. – Meet Noah, Abraham, Sarah, Joseph and a host of other characters and read about how it all began. You can purchase a copy for $14.99 at Green Egg Media. – Jesus and His disciples continue their ministry as they travel through Judea performing God’s miracles and delivering His word. – Many people are moved by the miracles and teachings of Jesus and come to follow Him as their Savior. – The Jewish leaders begin to feel threatened by his popularity, and come up with a plan to kill Jesus. – Jesus concludes His earthly ministry by sharing His last supper with the disciples and putting into motion God’s plan to save the world by giving His own life. I was contacted by Green Egg Media to see if I’d like to do a review of a copy of the Power Bible, having not heard of them or the Power Bible before I went to their website and looked around and then I called my children over and asked them if they’d like me to review a copy of this Bible. When I showed them they all three said, most definitely yes, and when I emailed Green Egg Media back to let them know I’d like to review the 1st volume they also offered me a second – so wanting to make sure I got a bit of the Old Testament and the New Testament I also asked for Volume 8. They’ve been given the Moms Choice Award, and I can see why these are easy to read – in fact if your child struggles with reading these may help them as the words are few and are simple for ease of use and the cartoon figures make it engaging and fun, they won’t even know they’re reading! Volume 1 is 208 pages and measures 10 by 7.3 by 0.5 inches and Volume 8 is 196 pages and measures 10 by 7.2 by 0.1 inches. Both volumes have thick paperback covers that can withstand many openings and closings and thick pages that are meant to stand up to children using them repeatedly. I read through both of these Bibles in a matter of just a few hours, that is how easy of area they are so while even my oldest, fast reader will enjoy them (she likes the kind of cartoon art that is used to illustrate) as will my non-reader and my not so strong reader. There is something for everyone in this Bible – whether adult, child or child at heart – this will have you reading the Bible in a way that is easy to understand but in no way takes away or add to the original Scripture. Children aren’t only reading the words but they are experiencing it which means they will linger over the illustrations AND the words allowing them to learn more and really feel what the Scripture means for them. The engaging form that the Power Bible uses is really a great way to instill Biblical truths, if you can’t be reading right then like if you’re driving, then the Power Bible can occupy a child(ren) in the backseat, even if they can’t read the pictures can speak to them. Overall, I’m very impressed with the Power Bibles I received and I hope to add the others to the collection – the Old Testament sets which are Volumes 1-6 sell for $89.90 and the New Testament set which comprise Volume 7-10 sell for $59.90 – is a great deal especially if you’re looking for something that will have a life long impression and could be a wonderful gift for a birthday, holiday or even a baptism. These are just really awesome and all three of my children ask to read them or have me read aloud to them as they gather around to look at the pictures – I need to have a copy for each of them so they don’t fight over the copies we do have! I’m thankful to have had the chance to read and review these because it’s rare to find a Bible like these that impart God’s Word using His Word without diluting it and making it worthless, thank you Green Egg Media for making the Power Bible available. Be sure to check the Family Fun tab on the website for free coloring pages, verses of the week, power packs and activity pages to have even more learning fun in God’s Word. Please note you must be a United States resident age 18 or older and void where prohibited. All entries will be verified and I will remove unverifiable and cheat entries. Giveaway begins at 12:01a.m. EST on 7/14/14 and ends at 12:01a.m. EST on 7/25/14. Winner will be randomly chosen by Rafflecopter. So right now, I’m part of a giveaway which has a $700 giveaway value as part of my being on Diana Waring’s Launch Team for her Experience History Through Music curricula and I’m so happy to get to bring you another giveaway. 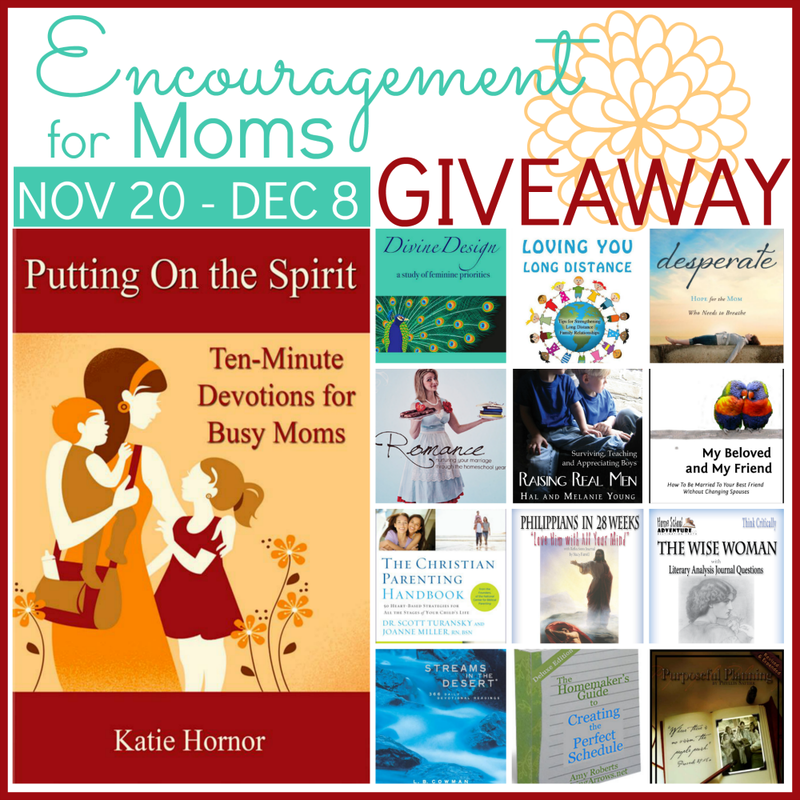 This is one is to win a set of Diana Waring’s Encouragement for Homeschool Moms – which is a set of five digital books that will inspire you as you seek to teach your children, both educationally and spiritually. Not a homeschool mom yet? Go ahead and enter! Veteran homeschool mom? Go ahead and enter! Just want to know what all us crazy moms do all day? I guess you can enter too! A hubby who wants to surprise his hard-working home educating wife? Enter! Please follow the link for the Rafflecopter form or visit my giveaway page on Facebook. You can find out more at the official website for the book. Since the success of his first book, Dr. Chapman has expanded his Five Love Languages series with special editions that reach out specifically to singles, men, and parents of teens and young children. He is the author of numerous other books published by Moody Publishers/Northfield Publishing, including Anger, The Family You’ve Always Wanted, The Marriage You’ve Always Wanted, Desperate Marriages, God Speaks Your Love Language, How to Really Love Your Adult Child, and Hope for the Separated. With Dr. Jennifer Thomas, he co-authored The Five Languages of Apology. I’ve had the pleasure of reading other of Gary Chapman books, such as The Five Love Languages of Children, and more – do a quick search of my blog for his name and more will pop up – and am always finding things to put to use in real life. This book The Marriage You’ve Always Wanted is no different – useful ideas to put into work in your marriage to make it better, because lets face it, most of our marriages can use work. At 143 pages this book is a quick read and just in time if you celebrate Valentines Day (we don’t) and only 9 chapters if you don’t read the introduction, epilogue, notes, and resources. One thing the Lord gave us all was the ability to get married, but not everyone today feels it’s the till death do us part that it was made to be and there in lies the issue, we decide we’re no longer in love so it’s time for a divorce. What if, you discovered love isn’t all about how you feel but rather how you live? Gary addresses the issue, “well my spouse doesn’t want to change – they still ignore me, aren’t a Christian, etc” and says that while this is hard it isn’t us who need to change our spouses, only the Lord can do that – we have to make the decision to let the Lord change us, we are the only ones we can be resposnible for. Is it fun or wonderful to live in a one sided marriage? No. However, Gary wants both spouses to read this book and partake together in the learning and growing both as people, as spouses and in the marriage that God so wants to bless. 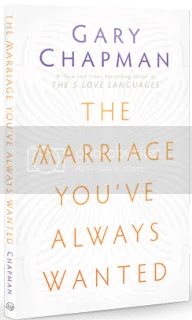 Gary Chapman addresses why people marry – it’s way different from what the world thinks marriage is for, why spouses/people don’t change, what is love, listening, role divisions, making decisions, marital relations, how to leave and still honor parents as well as money. I think the only thing I disagreed on in the whole book was his take on birth control and concern of overpopulation, but I don’t want to toss the whole book because of one area – the rest of the book has very valuable ideas and helps including the “Your Turn” at the end of each chapter which will allow spouses to see where their expectations are and how they can change them. Overall, this is a valuable book – whether you’re newlyweds, veterans or on the brink of divorce but want to restore your marriage, this book has something for everyone! 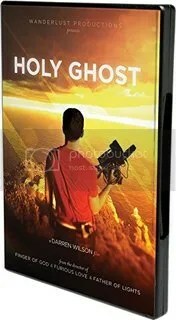 Use the link below to enter using the Rafflecopter form – if you have won this DVD on another blog you are ineligible to win again. Open to US and Canada only. 18 years old and over. 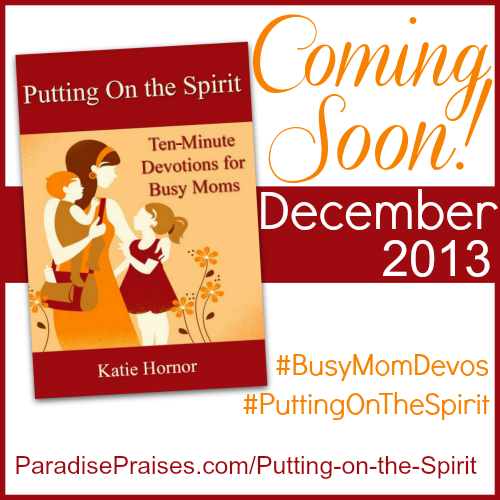 I introduced you to the new book Putting on the Spirit: Ten-Minute Devotions for Busy Moms by Katie Hornor in my post here. I cannot say how great this devotional is and if you’d like to win your own copy as well as some other great books enter this launch team’s (which I’m proud to be a part of) giveaway! 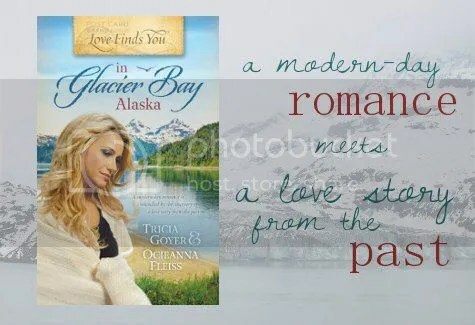 Nominate a friend to win Love Finds You in Glacier Bay Alaska! This giveaway isn’t for you though – the catch is you have to nominate someone to win – a friend? a wife? pastor’s wife? Nominate them using this form and when you fill out the form be sure to put in my blog (just copy and paste) https://growingforchrist.wordpress.com so that the authors know where the winner came from! 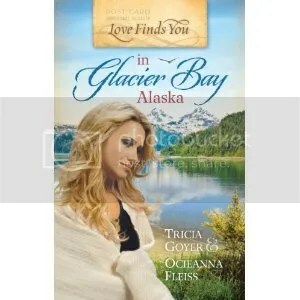 Be sure to tell Tricia and Ocieanna why the person you nominated deserves this book – Do they wish to travel to Alaska? Do they have an awesome love story like Ginny and Brett? But, don’t put it here, it’ll all go in the form I’ve linked to above, however if you’d like to please comment and let me know you’ve nominated someone and if you do that – I’ll give you an extra entry for the next contest I run for the book! Now before you wonder, “What about me?”, don’t worry I’ll be having another contest where some more blessed readers will have their chance to win a copy for themselves! GIVEAWAY ENTRANT’S RULES 1.) Those who enter by filling out the form agree to these rules. If you do not agree, do not enter. 2.) This giveaway is open to residents of the US and Canada, who are at least 18 years of age, unless otherwise noted or prohibited by your state. Description and approximate retail value of prize is included in giveaway post. No purchase necessary. 3.) Entry must be submitted by 12:01am EST of specified date. 4.) The winner is selected by the authors, Tricia Goyer and Ocieanna Fleiss. Odds of winning depend on number of entries received. 5.) Winner is notified by email and posted on the giveaway post. Winner must claim their prize within 48 hours or a new winner will be selected. 6.) Winner must provide a valid mailing address, excluding P.O. Boxes. for prizes shipped by the sponsors. 7.) One entry per person. 8.) This giveaway is NOT associated, sponsored nor endorsed by Facebook or Twitter. 9.) Growing for Christ and the LFYIGBA Pay It Forward Giveaway bloggers are not responsible for sponsors that do not fulfill this prize. We have represented the sponsor with the expectation they will fulfill their prize and in a timely manner. We will contact the sponsor regarding your prize. The sponsors, in most cases, are shipping the items to you directly. We cannot be held responsible for lost, damaged or undelivered prizes. We will make every effort to assist you obtaining your prize. If there is an issue with a sponsor please notify me within 30 days for assistance, after that I may be unable to assist you. Win 1 quart (32 ounces) of Tropical Traditions Virgin Cocunut Oil!!! ends May 14th CLOSED. Tropical Traditions is America’s source for coconut oil. You can learn more about Virgin Coconut Oil: America’s First Traditional Handcrafted Virgin Coconut Oil by watching this video. Here’s a video on the many uses of coconut oil. You can also view some videos of recipes using coconut oil here. Winner was Life at Rossmont!!! You must be 18 year or older. A resident of the U.S. or Canada. One entry per household only. Void where prohibited. You must leave an email in your entry – if I cannot contact you I will chose another winner. Winner will be randomly selected by a random process decided upon by me on Monday, May 14th, 2012 at noon EST The first entry is mandatory. **Disclaimer: Tropical Traditions provided me with a free sample of this product to review, and I was under no obligation to review it if I so chose. Nor was I under any obligation to write a positive review or sponsor a product giveaway in return for the free product. I did enjoy this second book in the Forgotten Castles series, however, unlike the first one I would not let my unmarried daughter’s read this book. I enjoyed all the plot twists but the violence, unmarried people lying and sleeping in the same bed, and lots of kissing and touching between unmarried people, is enough to send warning bells for young readers who may have read the first book. While I say this as a caution, I must admit I did enjoy the book, even though I didn’t agree with the choices and actions made by the characters. This was a definite page turner, and I’m looking forward to finishing the series when the next book comes out later this year. So, if you’ve read the first and want to or need to know what happens with the Duke, Mr. Lemon and Alexandria then grab this one! Winner is The Happy Homeschool Mom!!! You must be 18 year or older. A resident of the U.S. One entry per household only. Void where prohibited. You must leave an email in your entry – if I cannot contact you I will chose another winner. Winner will be randomly selected by a random process decided upon by me on Monday, May 7th, 2012 at noon EST The first entry is mandatory. Tell me one reason you’d like to win this book. Do you like Regency? Christian romance? Did you read the first one and want to find out what happens? To be their best, children need to feel loved. But if you and your child speak different love languages, your affection might get lost in translation, affecting the child’s attitude, behavior, and development. Dr. Gary Chapman’s groundbreaking Five Love Languages series has helped millions of couples communicate love more clearly, and Dr. Ross Campbell M.D. has applied the innovative system to children as well. The 5 Love Languages of Children gives practical suggestions for learning how your children interpret love and creating a sense of security in which they can thrive. Now with over 1,000,000 copies sold! This is a wonderful book. I have never read the other love languages books but after reading this one about children’s love languages I just might have to check out the one for adults. I’m hoping to utilize the ideas in this book to better build the bonds between my children and I – and I also thought it might be fun to introduce the treasure hunt to my 4-H group so that all the adults will be better able to respond to the children there but on a much larger scale. Most parents do love their children but some of us struggle on how to show that love – I asked my oldest the other day if she knew I loved her and she said “I know you do but you don’t show it”. What a wake up call. I’ve learned that for her gifts and quality time are her love languages where my other two seem to be physical touch and quality time. If you’re thinking, like I was, well I can’t afford to buy a gift every day or I don’t have time to do one on one things – think again. There are so many ideas in this book to jump start you speaking your child’s love language and if your child’s love language is gifts – it doesn’t have to be bought, something made (I like gifts and 5 year old will bring me a bouquet of dandelions, what a gift!) will suffice and if you can’t make it or buy it the book will help with that too. I’m so glad that I agreed to do this review because I almost passed it up on the thought that I didn’t need this but I did and I think all parents do to. There is a also a free study guide that you can download here. You will win a physical copy of this book to enjoy! You must be 18 year or older. A resident of the U.S. One entry per household only. Void where prohibited. You must leave an email in your entry – if I cannot contact you I will chose another winner. Winner must respond to my email within 48 hours – or a new winner will be chosen. Winner will be randomly selected by a random process decided upon by me on Monday, April 30, 2012 at noon EST The first entry is mandatory. 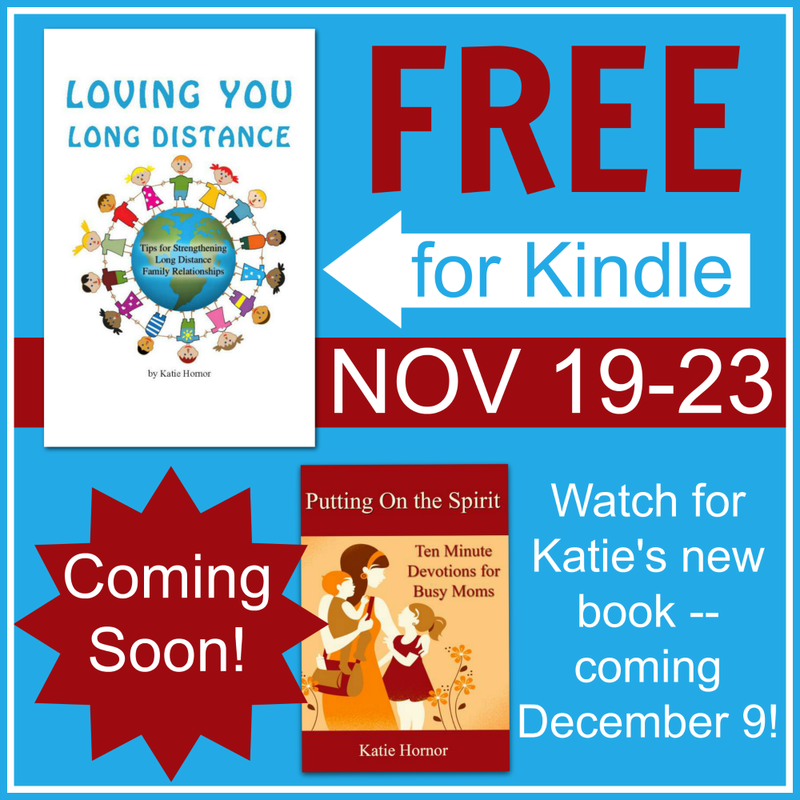 Do you know your child’s or your grand child’s love language? 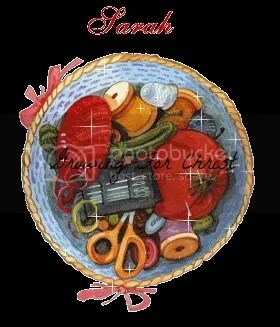 Gifts, Words of Affirmation, Quality Time, Physical Touch or Acts of Service? 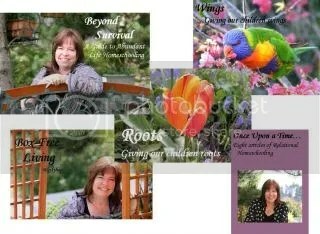 Follow me using Linky Followers on my right side bar. Leave a comment for each way you enter w/a way to contact you. Please read all other rules above.